Wearing: forever 21 tank, champion sports bra (similar), lululemon wonder under (similar and cheaper), leg warmers (similar), OPI big apple red, and using blue yoga mat. Heads up: The YBC Yoga Forum is now open! It's a place where health conscious people are coming together to chat about everything from playlists to pigeon pose. Come join, we'd love to connect! About eight years ago, my local yoga studio was having some sort of summer celebration that entailed 108 sun salutations on the front lawn. My initial reaction? WHY. Sun salutations are boring. And they hurt my wrists. I'm still not a fan of the same sun salute over and over, but playful sequencing and cool variations thrown in the middle take them from mundane to interesting. There are a few poses, however, that remain the core of a sun salute. No matter what variation or unique twist you put on a sun salute, it's likely that downward dog, plank pose and chaturanga (reverse push up) will always be in the mix. Because we see these poses so often is yoga classes, it's vital to check our alignment to protect from injury and promote the strengthening of our practice. These are the most common mistakes I see in the three poses. Pin it! Common mistakes in plank pose and how to fix them. For plank pose, it's important to keep the hips in line with the body, engage the core, and bring the heart forward. Pin it! 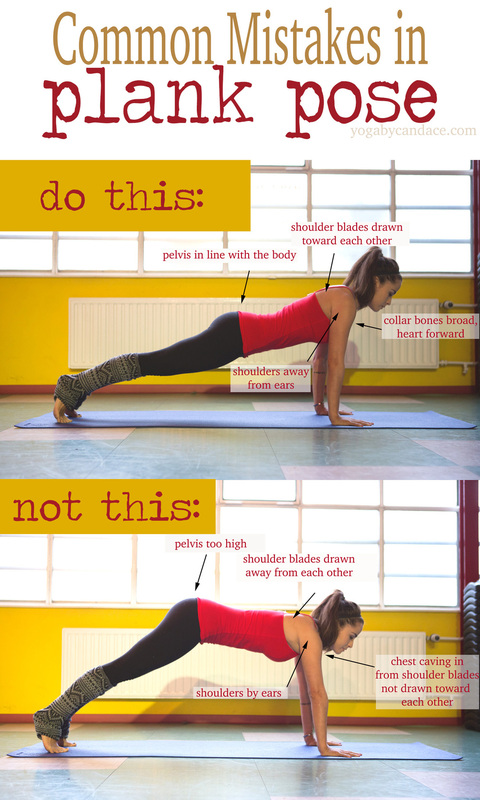 Common mistakes in chaturanga and how to fix them. Cahturanga is tough. There, I said it. It requires a lot of upper body strength in order to do it properly. If you're still working on building up the strength, modify by coming down onto your knees. Keep the elbows straight back behind you, and close to the body. Hips are in line with the body. TIP: Take your gaze out in front of you, not straight down. This will encourage the chest to stay broad rather than caving in. Pin it! Common mistakes in Down Dog and how to fix them. 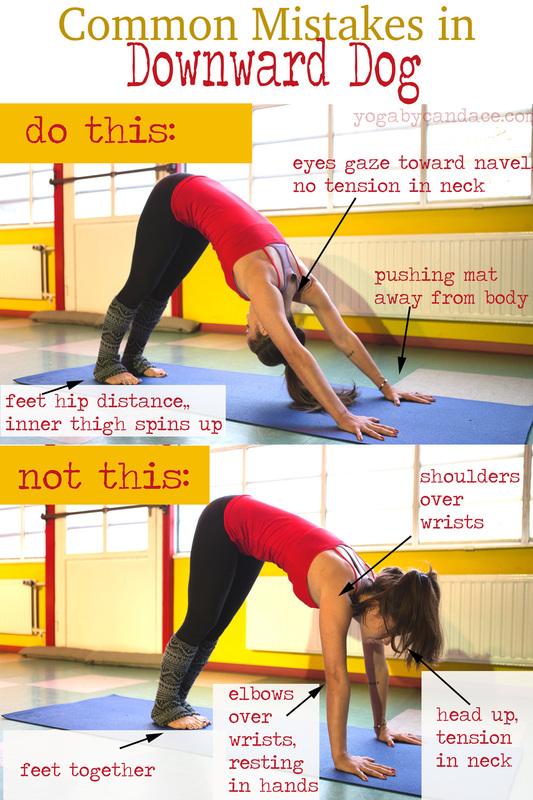 For down dog, make sure you're pressing into the right place in the hands to avoid wrist pain. Then, focus on pushing the mat away from the body, and lifting the tailbone to the sky. TIP: Picture your body like an upside down letter V, and envision spinning the inner thighs toward the sky. This visualization will help bring the body into proper alignment. PS- A breakdown of a bunch of other yoga poses, and 3 yoga poses for sculpted arms.